Doncaster Rovers boss Grant McCann has insisted that he ended up at the right club ahead of this weekend’s South Yorkshire derby at Barnsley. 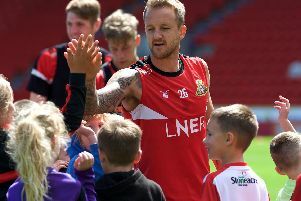 The Northern Irishman, who had a brief spell as a player at Oakwell, held talks with the Reds over the summer following Jose Morais’s departure. Barnsley went on to appoint German Daniel Stendel following their relegation from the Championship and former Peterborough United manager McCann replaced Darren Ferguson in the Keepmoat Stadium hot seat. “It was a conversation I had when I was out of work,” said McCann. “But I’m pleased at the club that I've come to and I’ve enjoyed every minute of it. “Hopefully I can have a few more good years here. McCann signed for Barnsley in November 2006 but left to join Scunthorpe just over a year later. It is a period of his playing career that the 38-year-old does not remember too fondly – but he insists he has no point to prove this weekend. “When I left Cheltenham I went there and I’ve always been open and honest that it probably wasn’t my best year in football,” he said. “I don't think I was highly thought of at Barnsley, in my opinion. “I didn’t play many games and when I did play I was played out of position. “I scored on my debut against Ipswich which I really like and I’ve got some memories from there. “I’ve got some good friends still at Barnsley, people like Martin Devaney and Bobby Hassell. “One of my boys, Jesse, was born in Barnsley Hospital and I’ve still got my house in Barnsley that I rented off the football club. “It’s a club I enjoyed being at but personally myself I didn’t feel as if I got the best out of me at Barnsley during my playing career. “But we move on, and I ended up having an okay career after I left Barnsley. “It’s just another game for me this weekend,” he added. “I don’t have any point to prove and my only concern is Doncaster.